There's a special component intended to change SQL queries according to the end-user data browsing needs: QueryTransformer. It was made to meet the needs of programmers who want to let the end-users to transfigure data while browsing query result set in the grid. The component lets change data sorting and filtration while browsing the query result data in the grid, apply limits to the result set, and calculate totals by columns. To set up the QueryTransformer object you must initialize its QueryProvider property with visual QueryBuilder component or non-visual SQLQuery object. This will be the source for the initial query to be transformed. On changing the initial query, the transformed query will be changed instantly. Of course, if the new initial query doesn't contain some columns to which the modifications are applied, the corresponding modifications will be void. column.PreassignedName = "New column name"
Read the QueryTransformer and accompanying classes property reference for details. 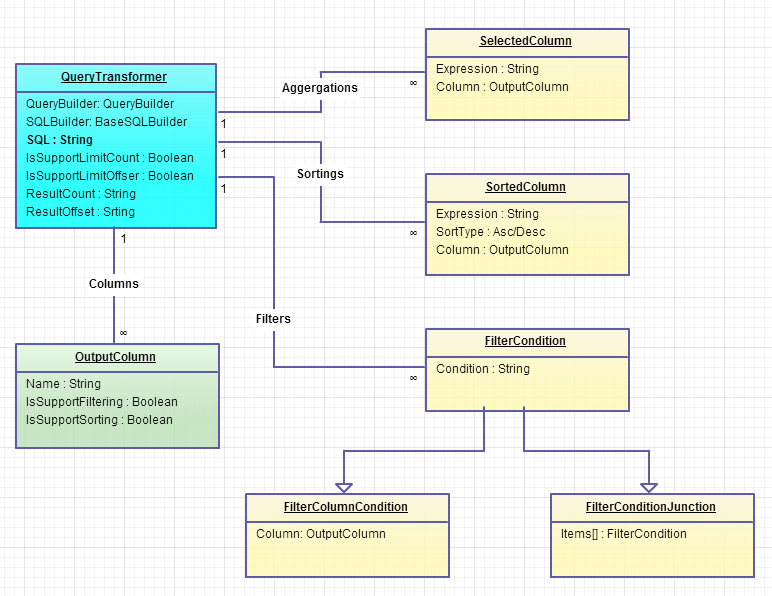 Below are the object relationship diagram and code samples for different languages. // you can also use the non-visual SQLQuery object as a source of initial SQL query.
' you can also use the non-visual SQLQuery object as a source of initial SQL query.